I've chosen two dark, but bright purple polishes. 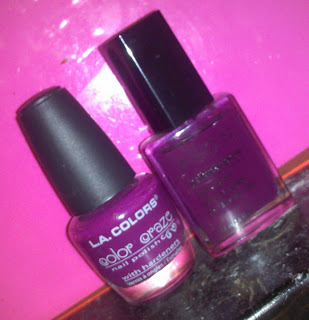 The first is a bright violet by L.A. Colors' Color Craze. What I like about L.A. Colors is that they are cruelty free (as is listed on the bottle). I couldn't find a name of the color, but on the bottom of the bottle there was a 22 imprinted in the glass. And on the side of the bottle had Lot#/Batch code4216. 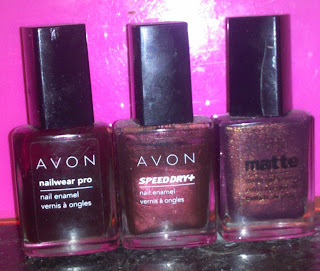 The next color I've selected in the purple family is a lovely bright plum by Avon. Called 'Berry Smooth' this is what I've been wearing as a toe polish. Dark enough for fall, and bright enough to be noticeable. I think these colors are perfect for those with a bit of a tan or a darker skin tone. 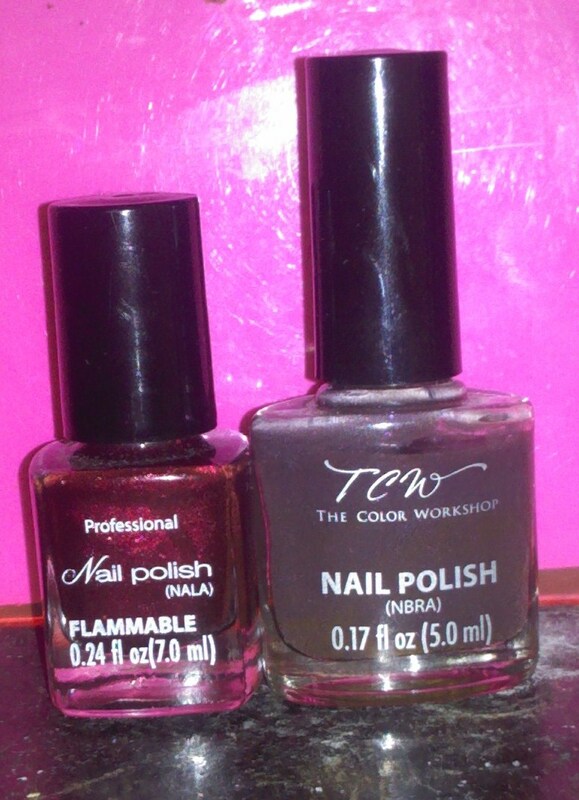 Next in my fall polishes are in the red-brown family. The first is a dark darrrk burgundy color by Avon called 'Tweed [N226]'. It's perfect as a toe color or if you want to add some drama to your look, use it as a fingernail color. Because it's nailwear pro (a nail enamel) it gives great strength and protection to the nail. If you're sad about saying goodbye to your bright orange or neon polish, never fear! Avon's 'Brown Pearl' is the autumn alternative. Since it's a speeddry+ it's great for the days where you need a quick, no smudge manicure when you're on the run. Brown Pearl is a gorgeous bronze color with small gold shimmers. Reminds me of a fall sunset. Lastly from the brown-red family is Avon's 'Red Velvet'. Though it says 'Matte' on the bottle, this pretty velvety-brown polish is filled with yellow-gold speckles. Great for those fall evening strolls, gazing at the changing colors of the leaves. The b-e-a-uuuutiful burgundy polish is what I currently have on my fingers for the fall. I love love love this because not only is it the perfect shade of red, but it has a sheen of gold in the sunlight. Just like a leaf you find on the ground in late fall. Perfectly dramatic and compliments those with a golden/yellow undertone to their complexion. The last polish I've chosen to feature is a great, CHEAP dupe for OPI's 'You Don't Know Jaques'. For those who want a matte polish with NO shimmer, this is the autumn shade for you. And it's of a pastel tone, so it's great for those who also want a lighter shade. I hope you've enjoyed this post and if you have any comments/questions/concerns please leave them in the comment section! !